Part 9 of our fascinating story of Vicky Rylance’s childhood experiences in Malta during WWII. 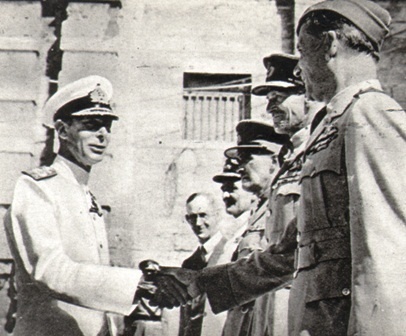 King George VI’s visit to the Island was a great morale booster for the people of Malta. 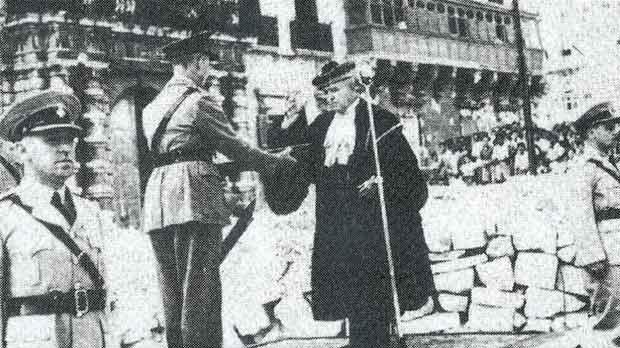 However, only a few short months before the King’s visit, life in Malta had become unbearable. Food was quite impossible to obtain and the people were suffering from malnutrition and in fact from plain hunger. In reality Malta was only a few short weeks away from starvation. Morale was at its lowest ebb. All one could see was terrible devastation for miles around the GrandHarbour area. The harbour itself was like a graveyard of half sunken wrecks. For several months no convoys had been able to make the rat run between Gibraltar to Malta, they had either been sunk or had to turn back. The few who made it into the harbour had been sunk before they could unload. The only possible link with the outside world was by submarine. These did their best but their brave efforts were only a drop in the ocean. By August 1942, people existed only on the meagre rations they got from the Victory Kitchens. As there was no more coal, the electricity stations had to be shut down and people had to use paraffin lamps – that is if they could find any paraffin. Everything was running out. There was a ‘target date’ beyond which the Island could no longer survive. The people of Malta now knew that only the Almighty could save them and it was to Him that they turned as their forefathers had done before them over the centuries. Prayers were said incessantly to God, our Patron Saints and especially to Mary, the Mother of Jesus, Patron of Malta. These prayers were heard. On the 15th of August 1942, the feast of the Assumption of Our Lady, a convoy of ships limped into the GrandHarbour bearing much needed supplies to the Island. It had been attacked many times on its way and many ships had been sunk with all their brave sailors in them. Thousands of Maltese had heard of the coming convoy and were already lining the bastions waiting with their hearts in their mouths for its arrival. There was mortal fear of the ships being sunk before the very eyes of the starving population. Enemy airplanes came again and again to bomb the convoy but with little success, loosing forty planes on the process. When the ships finally limped in, there was great jubilation from the bastions, as people waved Union Jacks and Maltese flags in welcome. Many were in tears. The sailors on board were lined on deck and returned the cheers of the population. It was a wonderful day for the people of Malta, to be remembered forever and it has become known down the years as the ‘Convoy of Santa Maria’. Food had arrived and the second Siege of Malta had ended. We who were still alive had come through it, we had survived. As soon as the ships came in, men from all walks of life found themselves on the quay, as if called by some supernatural signal. Crates were passed from hand to hand and within six hours the ships were unloaded and out at sea again. It is said that even the Governor of the Island, Lord Gort, was there lending a hand together with stevedores, farmers, priests, stall holders and even children. This event virtually lifted the Siege. It was as if the enemy knew that nothing he could dump on the Island was going to break the people’s spirit. The raids continued for a time but with less ferocity and eventually petered out. Please note that next month’s issue will be the final part in this series.